Not to be confused with shipbuilding. It has been suggested that Boat building tools be merged into this article. (Discuss) Proposed since March 2019. Wood is the traditional boat building material used for hull and spar construction. It is buoyant, widely available and easily worked. 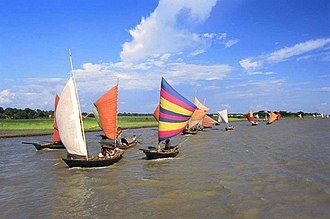 It is a popular material for small boats (of e.g. 6-metre (20 ft) length; such as dinghies and sailboats). Its abrasion resistance varies according to the hardness and density of the wood and it can deteriorate if fresh water or marine organisms are allowed to penetrate the wood. 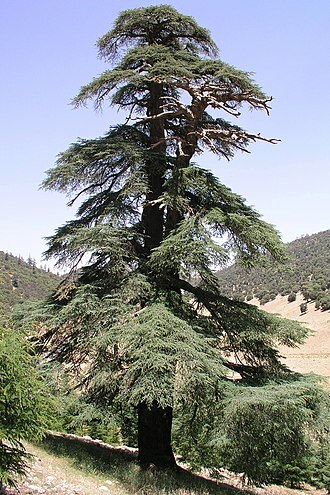 Woods such as Teak, Totara and some cedars have natural chemicals which prevent rot whereas other woods, such as Pinus radiata, will rot very quickly. The hull of a wooden boat usually consists of planking fastened to frames and a keel. Keel and frames are traditionally made of hardwoods such as oak while planking can be oak but is more often softwood such as pine, larch or cedar. Plywood is especially popular for amateur construction but only marine ply using waterproof glues and even laminates should be used. Cheap construction plywood often has voids in the interior layers and is not suitable to boat building as the voids trap moisture and accelerate rot as well as physically weaken the plywood. No plywood is rot resistant and should be coated with epoxy resin and/or a good paint system. Varnish and Linseed oil should not be used on the exterior of a hull for waterproofing. Varnish has about 60% of the water resistance of a good paint system. Only boiled linseed oil should be used on a boat and only in the interior as it has very little water resistance but it is very easy to apply and has a pleasant smell. Note that used linseed rags should not be left in a pile as they can catch fire. A valuable 200-year-old waka (Maori canoe) caught fire in New Zealand in June 2014 when restorers left rags piled overnight. Raw linseed oil is not suited to boats as it stays damp and oily for a long time. Mildew will grow well on raw linseed oil treated timber but not on boiled linseed oil. More recently introduced tropical woods as mahogany, okoumé, iroko, Keruing, azobé and merbau. are also used. With tropical species, extra attention needs to be taken to ensure that the wood is indeed FSC-certified. Teak or iroko is usually used to create the deck and any superstructure. Glue, screws, rivets and/or nails are used to join the wooden components. Before teak is glued the natural oil must be wiped off with a chemical cleaner, otherwise the joint will fail. Carvel, in which a smooth hull is formed by edge joined planks attached to a frame. The planks may be curved in cross section like barrel staves. Carvel planks are generally caulked with oakum or cotton that is driven into the seams between the planks and covered with some waterproof substance. It takes its name from an archaic ship type and is believed to have originated in the Mediterranean. A number of boat building texts are available which describe the carvel planking method in detail. Clinker is a technique originally identified with the Scandinavians and Ingveonic people in which wooden planks are fixed to each other with a slight overlap that is beveled for a tight fit. The planks may be mechanically connected to each other with copper rivets, bent over iron nails, screws or in modern boats with adhesives. Often, steam bent wooden ribs are fitted inside the hull. Strip planking is yet another type of wooden boat construction similar to carvel. It is a glued construction method which is very popular with amateur boatbuilders as it is quick, avoids complex temporary jig work and does not require shaping of the planks. Sheet plywood boat building uses sheets of plywood panels usually fixed to longitudinal long wood such the chines, inwhales (sheer clamps) or intermediate stringers which are all bent around a series of frames. By attaching the ply sheets to the longwood rather than directly to the frames this avoids hard spots or an unfair hull. Plywood may be laminated into a round hull or used in single sheets. These hulls generally have one or more chines and the method is called Ply on Frame construction. A subdivision of the sheet plywood boat building method is known as the stitch-and-glue method, where pre-shaped panels of plywood are drawn together then edge glued and reinforced with fibreglass without the use of a frame. Metal or plastic ties, nylon fishing line or copper wires pull curved flat panels into three-dimensional curved shapes. These hulls generally have one or more chines. Marine grade plywood of good quality is designated "WBP" (which stands for water- and boiled-proof) or more usually BS 1088. Australian plywood manufacturers and suppliers have issued warnings that some Asian nations are selling ply stamped BS 1088 which does not meet international standards. Specifically, they say outer plies are too thin (should be 1.2 mm or 0.047 in minimum) or are very thin (less than 0.5 mm or 0.020 in) or high-grade surface ply such as Okoume is combined with a much heavier and wider inner cores. Most high-grade marine Okoume (Gaboon) ply uses lightweight poplar inner cores. Often the 1088 stamp is blurred in the poor Asian ply so it is not clear. In Australia and New Zealand a higher-grade marine ply than BS1088 is AS2272. It requires both faces to be "A" quality, with even-thickness plies. The most common plywood used for this grade is plantation-grown Hoop Pine which is fine grained, very smooth, moderately light (at 570 kg/m3 or 36 lb/cu ft it is the same weight as Meranti ply and about 13% heavier than genuine poplar cored BS1088 Okoume). 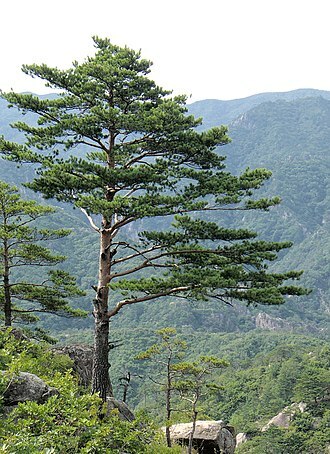 Hoop pine has a very high stress rating of F17, indicating high strength. Meranti (Lauan) ply has a stress rating of F14 and Okoume ply F8. Okoume ply is commonly coated with epoxy to increase strength and impact resistance as well as to exclude water. Both types of plywood construction are very popular with amateur builders, and many dinghies such as the Vaurien, Cherub, Tolman, Moth and P class (ply on frame construction) and FJs, FDs and Kolibris (stitch-and-glue method) have been built from it. Another variation is tortured ply where very thin(3 mm or 0.12 in) and flexible (often Okoume)preshaped panels ply are bent into compound curves and sewn together. Little or no framework or longitudinal wood is used. This method is mainly confined to kayaks. Cold moulding is a composite method of wooden boat building that uses two or more layers of thin wood, called veneers, oriented in different directions, resulting in a strong monocoque structure, similar to a fibreglass hull but substantially lighter. Sometimes composed of a base layer of strip planking followed by multiple veneers. Sometimes just veneers are used. Cold-moulding is popular in small, medium and very large, wooden super-yachts. Using different types of wood, the builder can lighten some areas such as bow and stern and strengthen other high-stress areas. Sometimes cold-moulded hulls are protected either inside or out or both with fibreglass or similar products for impact resistance, especially when lightweight, soft timber such as cedar is used. This method lends itself to great flexibility in hull shape. Cold-moulded refers to a type of building one-off hulls using thin strips of wood applied to a series of forms at 45-degree angles to the centerline. This method is often called double-diagonal because a minimum of two layers is recommended, each occurring at opposing 45-degree angles. The "hot-moulded" method of building boats, which used ovens to heat and cure the resin, has not been widely used since World War II; and now almost all curing is done at room temperature. Either used in sheet or alternatively, plate  for all-metal hulls or for isolated structural members. It is strong, but heavy (despite the fact that the thickness of the hull can be less). It is generally about 30% heavier than aluminium and somewhat more heavy than polyester. The material rusts unless protected from water (this is usually done by means of a covering of paint). Modern steel components are welded or bolted together. As the welding can be done very easily (with common welding equipment), and as the material is very cheap, it is a popular material with amateur builders. Also, amateur builders which are not yet well established in building steel ships may opt for DIY construction kits. If steel is used, a zinc layer is often applied to coat the entire hull. It is applied after sandblasting (which is required to have a cleaned surface) and before painting. The painting is usually done with lead paint (Pb3O4). Optionally, the covering with the zinc layer may be left out, but it is generally not recommended. Zinc anodes also need to be placed on the ship's hull. Until the mid-1900s, steel sheets were riveted together. Aluminum and aluminum alloys are used both in sheet form for all-metal hulls or for isolated structural members. Many sailing spars are frequently made of aluminium after 1960. The material requires special manufacturing techniques, construction tools and construction skills. It is the lightest material for building large boats (being 15-20% lighter than polyester and 30% lighter than steel). Aluminium is very expensive in most countries and it is usually not used by amateur builders. While it is easy to cut, aluminium is difficult to weld, and also requires heat treatments such as precipitation strengthening for most applications. Galvanic corrosion below the waterline is a serious concern, particularly in marinas where there are other conflicting metals. Aluminium is most commonly found in yachts and power boats that are not kept permanently in the water. Aluminium yachts are particularly popular in France. A relatively expensive metal used only very occasionally in boatbuilding is cupronickel. Arguably the ideal metal for boat hulls, cupronickel is reasonably tough, highly resistant to corrosion in seawater, and is (because of its copper content) a very effective antifouling metal. Cupronickel may be found on the hulls of premium tugboats, fishing boats and other working boats; and may even be used for propellers and propeller shafts. Fiberglass (glass-reinforced plastic or GRP) is typically used for production boats because of its ability to reuse a female mould as the foundation for the shape of the boat. 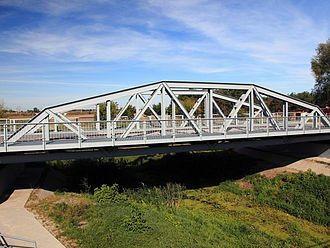 The resulting structure is strong in tension but often needs to be either laid up with many heavy layers of resin-saturated fiberglass or reinforced with wood or foam in order to provide stiffness. GRP hulls are largely free of corrosion though not normally fireproof. These can be solid fiberglass or of the sandwich (cored) type, in which a core of balsa, foam or similar material is applied after the outer layer of fiberglass is laid to the mould, but before the inner skin is laid. This is similar to the next type, composite, but is not usually classified as composite, since the core material in this case does not provide much additional strength. It does, however, increase stiffness, which means that less resin and fiberglass cloth can be used in order to save weight. Most fibreglass boats are currently made in an open mould, with fibreglass and resin applied by hand (hand-lay-up method). Some are now constructed by vacuum infusion where the fibres are laid out and resin is pulled into the mould by atmospheric pressure. This can produce stronger parts with more glass and less resin, but takes special materials and more technical knowledge. Older fibreglass boats before 1990 were often not constructed in controlled temperature buildings leading to the widespread problem of fibreglass pox, where seawater seeped through small holes and caused delamination. The name comes from the multiude of surface pits in the outer gelcoat layer which resembles smallpox. Sometimes the problem was caused by atmospheric moisture being trapped in the layup during construction in humid weather. "Composite construction" involves a variety of composite materials and methods: an early example was a timber carvel skin attached to a frame and deck beams made of iron. Sheet copper anti-fouling ("copper=bottomed") could be attached to a wooden hull provided the risk of galvanic corrosion was minimised. Fast cargo vessels once were copper-bottomed to prevent being slowed by marine fouling. GRP and ferrocement hulls are classic composite hulls, the term "composite" applies also to plastics reinforced with fibers other than glass. When a hull is being created in a female mould, the composite materials are applied to the mould in the form of a thermosetting plastic (usually epoxy, polyester, or vinylester) and some kind of fiber cloth (fiberglass, kevlar, dynel, carbon fiber, etc.). These methods can give strength-to-weight ratios approaching that of aluminum, while requiring less specialized tools and construction skills. First developed in the mid-19th century in both France and Holland, ferrocement was also used for the D-Day Mulberry harbours. After a buzz of excitement among homebuilders in the 1960s, ferro building has since declined. Ferrocement is a relatively cheap method to produce a hull, although unsuitable for commercial mass production. A steel and iron "armature" is built to the exact shape of the hull, ultimately being covered in galvanised chicken netting. Then, on a single day, the cement is applied by a team of plasterers. The cement:sand ratio is a very rich 4:1; do not call it concrete! As the hull thickness is typically 2.5 to 3 cms, ferrocement is unsuitable for boats less than about 15 metres LOA as there is a weight penalty; above that length there is no penalty. Properly-plastered ferrocement boats have smooth hulls with fine lines, and amateur builders are advised to use professional plasterers to produce a smooth finish. In the 1960s and 1970s, particularly in Australia and New Zealand, the cheapness of ferro construction encouraged amateur builders to build hulls larger than they could afford, not anticipating that the fitting-out costs of a larger boat can be crippling. properly-built, a ferro hull is as fair as a GRP hull. many home-built ferro boats are lumpy, overweight and ugly. some early builders, realising that their creation proved to be disappointing, scuttled their vessels and fraudulently claimed insurance. accordingly, ferro yachts may be difficult to sell and nigh impossible to insure. See also: concrete ship, concrete canoe. Smooth curve hull: these are rounded and free of chines or corners. Chined hulls: these are hulls have flat panels (typically plywood) which meet at a sharp angle known as the "chine". Chined hulls range from simple flat-bottomed boats where the topsides and bottom meet at about 110 degrees (such as banks dories and sharpies) to skiffs where the bottom is arced rather than flat. Multi-chine hulls allow an approximation of a round hull shape. Flat-bottomed hull: flat-bottomed hulls are suitable for canals and non-tidal rivers. They are often shallow-draft, and may operate in shallower water. They are cheap to build but, being less stable and having no keel to give directional stability, they are unsuitable for sea-going vessels. (However, large ships are almost always flat bottomed, having a suitably large draft to overcome the problems of small flat-bottomed boats). Displacement hulls: a displacement hull always remains partly submerged. Such a hull has a maximum "hull speed" which is a function of its waterline length. An exception is the catamaran, whose twin hulls are usually so fine that they do not engender a bow wave. Planing hulls: planing hulls have a shape that allows the boat to rise out of the water as the speed increases. Sail boats that plane are typical V-shaped at the bows and flat-bottomed aft. Hydroplanes are very light, flat bottomed, high powered speed boats that plane easily on flat water, but they become unstable in rough water. Powerboats designed for rough water are usually deep V-bottomed with a deadrise angle of about 20-23 degrees. The most common form is to have at least one chine to allow for stability when cornering and for a supportive surface on which to ride while planing. Planing hulls allow much higher speeds to be achieved, as they are not limited by the waterline length the way displacement hulls are. Planing hulls need sufficient power to "reach the plane", after which the lack of drag allows high speeds yet with reduced power consumption. Anchor: a device for holding a boat to the seabed, typically with chain and rode. Traditional anchors include the fisherman, Danforth, and plough types (such as the "CQR" and "Delta"). Recently, far more effective anchors with more reliable holding include the "Rocna" and the "Ultra", both of which are spade anchors. Bitts: a pair of short strong posts of wood or steel on the deck of a boat intended to take mooring lines. Also called "bollards". Bilge: the lowest part of the interior of a hull. Water, fuel tanks, ballast, and heavy stores are variously placed in the bilge to lower the craft's centre of gravity. Bilge keels: a pair of short keels fitted on either side of the hull. Less hydro-dynamically efficient than a fin keel, they have a shallower draft. Full-length bilge keels add rigidity to a hull. Bilge keel craft are found in areas with large tidal ranges to keep the vessel upright when dried out. Bilge pump: a manual or electric pump for draining the bilge. Set at the lowest point, its inlet is protected by a screen to minimize blockages. Block: a pulley used to give a line a fair lead and multiply its hauling power. Single and double sheave blocks are common, triple rare. Bobstay: a stay attached between the stem and outer end of a bowsprit to prevent it from rising under the tension of sail. Bow: The forward end of a watercraft. Bowsprit: a spar that extends forward of the stem to provide an anchor for a jib. Breasthook: A roughly triangular component located immediately aft of the stem and between the inwales, sheer clamps, or rails of a small boat. Bulkhead: internal transverse walls dividing a hull. Bulwarks: topsides which extend above the deck, often capped with a rail and fitted with scuppers. Cam cleat: a mechanical device for holding a line fast between two spring-loaded jaws. Catheads: timbers protruding approximately at right angles from the foredeck to support an anchor outboard of the hull. Capstan a vertical winch secured to the foredeck, used primarily to hoist an anchor. Carlin: a longitudinal strip parallel to, but inboard of, the inwale (sheer clamp) for supporting the inboard edge of the side deck and the side of the cabin cladding. Chainplate: a metal bracket through-bolted through the hull for anchoring a shroud. Centreboard: (also dagger board) a movable keel which may be raised and lowered to accommodate shallow water and point of sail. It is held in place within a centerboard trunk. Chine: the part of a hull at the turn of the bilge. It may be "hard" (i.e. sharply angled) or "soft" (gradually contoured). 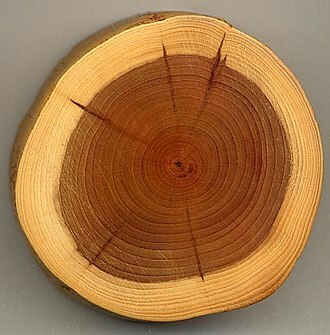 A chine made of a single timber is known as a chine log. Cleat: a fitting designed to tie off lines. The most common form has a central anchor point and opposing protrusions for taking turns of a line. Also cam and jam cleats. Cockpit: the seating area aft in a small decked vessel where the helm is. Counter stern: a stern rising well above the waterline ending in a point or rounded contour rather than a vertical transom. A variation is the "truncated counter". Companionway: a passage, fitted with either steps or a ladder, for transiting between decks. Crosstree: a form of spreader mounted athwarts a mast for attaching or tensioning shrouds or stays. Deck: a structure covering part or all of a hull, supported by beams. Deck beam: A beam for supporting the deck. Dolphin striker: a short downward-facing spar fitted mid-way along a bowsprit to tension the bobstay. Dorade: a ventilation intake consisting of a pivoting cowling atop a deck mounted self-draining box, named after the 1931 yacht Dorade where it was first used. Epoxy resin: a two-part thermosetting polymer increasingly used in modern wooden boat building variously as an adhesive, filler (admixed with other materials), and a moisture-resistant barrier in hull and deck construction, sometimes applied in conjunction with reinforcing cloths such as fibreglass, kevlar or carbon fibre. Fairlead: a deck fitting for redirecting a line and minimizing chafe. Fiddle (or fiddle rail). a low rail on a counter, stove, or table for preventing items from sliding off when the boat is heeled at sea. Catamarans have less need than monohulls for fiddles. Freeboard: the part of the hull between the waterline and deck of a vessel. Furling headsail: a jib or other headsail attached to a rotating mechanism that furls and unfurls it, manually or automatically. Garboard: the strake immediately on either side of the keel. Gimbal: a device that allows a stove or compass to self-level by pivoting in two horizontal planes simultaneously. Gooseneck: a pivoting metal fitting that joins a boom to a mast. Many goosenecks can be adjusted to trim the luff of a sail. Grab rail: an extended horizontal handhold, usually atop a cabin. Gudgeon: the female part of a pintle-and-gudgeon pivot or hinge, characteristically used to attach a rudder to a vessel. Gunwale: (pronounced "gunnel") the upper longitudinal structural member of the hull, typically fitted with scuppers to drain the deck. Hatch: an opening in the deck or cabin of a vessel, with a hinged, sliding, or removable cover. Heads: a marine toilet, deriving from toileting at the catsheads in square rigger days. Hull: the bottom and sides of a vessel. Inwale (or "sheer clamp"): the upper, inner longitudinal structural member of the hull, to which topside panels are fixed. Keel: the main structural member of a traditional vessel, running fore and aft from bow to stern on its centerline. It provides ballast for stability, and resistance to leeway moving through the water. Keelson: an internal beam fixed to the top of the keel to strengthen the joint of the upper members of the boat to the keel. King plank: the central board of a foredeck. Its sides are notched to receive the tapered forward ends of deck planking so that no end grain is exposed. Knee: a short L shaped piece of wood that joins or strengthens the joint in boat parts that meet between roughly 60 and 120 degrees. It may be a natural crook from a suitable wood species, sawn from a larger piece of timber, or laminated to size. Commonly used on thwarts to join topsides or keelsons to join transoms. A hanging knee sits upright beneath a thwart to support it. Hanging knees often support carlins where a full frame would be inconvenient. Mast: a large vertical spar which supports the sails. It may be supported by standing rigging, but some rigs (such a junks) have unstayed masted. Mast step: a socket to take the downward thrust of the mast and hold it in position. May be on the keel or on the deck in smaller craft. A deck-stepped mast may be supported by a column below the deck. Mizzen: the aftmost mast and sail in a yawl or ketch, or in a vessel with three or more masts. Oar a wooden pole enlarged on one end to resist the water when pulled. Painter: a short line at the bow of a small boat for tying it off. Parrot beak: a spring-loaded stainless steel fitting on the end of a spinnaker pole attaching it to the sail. Pintle: the male half of a pintle-and-gudgeon pivot or hinge. Ratlines (traditionally ratlins): lines woven horizontally between the shrouds of a square-rigged ship to provide footholds for ascending to the yards. Rib: a thin strip of pliable timber laid athwarts inside a hull from inwale to inwale at regular close intervals to reinforce its planking. Ribs differ from frames or futtocks in being far smaller dimensions and bent in place compared to frames or futtocks, which are normally sawn to shape, or natural crooks that are shaped to fit with an adze, axe or chisel. Rigging: standing rigging (either "stays" or shrouds") are the wire cables or rods that support the mast(s). Running rigging are the ropes ("sheets") to control the sails. Rowlock (pronounced "rollock";(also "oarlock"): a 'U' shaped metal device that secures an oar and acts as a fulcrum during the motion of rowing. Rudder: a hinged vertical plate at the stern for steering a craft. There may be more than one rudder. Sampson post: a strong vertical post which supports a ship's windlass and the heel of its bowsprit, also used to making off mooring lines. Scuppers: gaps in the bulwarks permitting water to drain off the deck. Shackle: a U-shaped fitting secured by a removable pin for securely connecting chains, lines, and other fittings. Known as a "snap shackle" when fitted with a spring-loaded pin. Sheave box: a plastic or stainless steel box that holds a pulley that is fixed in position as on a mast head. Sheer: the generally curved shape of the upper hull. It is traditionally lowest amidships to maximize freeboard at the ends of the hull. Sheer can be reverse, higher in the middle to maximize space inside, or straight or a combination of shapes. Sheet: a line which controls the clew of a sail. Skeg: a vertical blade beneath the hull, typically to support and protect the rudder and to promote the rudder's efficiency by preventing "stalling". Spar: s length of timber, aluminium, steel or carbon fibre of approximately round or pear shaped cross-section which supports a sail or sails. Spars include the mast, boom, gaff, yard, bowsprit, prod, boomkin, pole and dolphin striker. Sole: the floor of a cabin or cockpit. Spinnaker (or "kite"): a large, lightweight, down-wind sail used on fore and aft rigged yachts such as sloops to dramatically increase sail area typically used running with the wind. Spring: the amount of fore and aft curvature in the keel. Stanchions: a post for holding life lines on a deck. Stainless steel: a corrosion-resistant alloy of mild steel and small percentages of such metals as copper, chromium, molybdenum, and nickel. Common alloys are "18/8" (known as "surgical stainless steel") and "316" ("marine grade"), which contains more salt-water resistant nickel. Stays/shrouds: standing or running rigging which holds a spar in position (e.g. forestay, backstay, bobstay). Formerly made of rope, typically of braided stainless steel wire, occasionally solid metal rod. Stem: a continuation of the keel upwards at the bow where the two sides of the hull meet. Stern: the aftmost part of a boat, often ending in a transom. Stern sheets a flat area or deck, inboard of the transom in a small boat. It may contain hatches to access below decks or provide storage on deck for life saving equipment. Strake: planking, running from the "garboard" strake affixed to the keel to the "sheer" strake below the caprail. Stringer (also "batten"): a long relatively thin, knot free length of wood, running fore and aft, often used to reinforce planking on the inside of the hull. Synthetic rope: lines manufactured from chained chemicals. The four most common are: polyester (including brand names Dacron and Terylene), a strong, low stretch line, usually plaited (braided) used for running rigging; nylon, a strong but elastic line resistant to shock loads, best suited for mooring lines and anchor warps. It is usually laid (twisted) so to make it easier to grip when hauling; polypropylene, a light, cheap, slippery, buoyant line, typically laid, which is by far the weakest of the four, and deteriorates when exposed to sunlight. Commonly used on commercial fishing boats using nets; and Kevlar, an extremely strong and expensive fibre with almost no stretch, usually braided and best suited for halyards. Taff rail: a railing at the extreme stern of a vessel. Thwart: a transverse member used to maintain the shape of the topsides of a small boat, often doubling as a seat. Tiller: a forward-facing attached to the rudder allowing a helmsman to steer a boat. 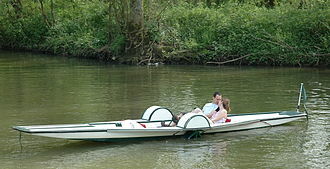 On a dinghy, the tiller may have a hinged extension called a "jigger". Toe rail: an upright longitudinal strip of wood surrounding a deck near the sheer, especially forward, for safety and to provide purchase when a boat is heeled. Topping Lift: a line running from a cleat on the mast through a block at the masthead and down to the aft end of a boom for supporting the boom when not in use or when reefing. Topsides: the side planking of a boat from the waterline to the sheerstrake. Transom: a vertical part of the hull at the stern. Transoms provide width and sadditional buoyancy at the stern. Dinghies may attach an outboard motor to the transom. Warp: anchor line, traditionally made of stiff natural fibre such as hemp, today of stronger, lighter, synthetic fibres such as laid nylon, prized for its elasticity in absorbing shock loads on an anchor. Winch: a geared device providing both friction and mechanical advantage in sail trimming, hoisting large sails, and retrieving an anchor. Some winches are self-tailing, allowing efficient one-man usage, others electrically powered. Wind pennant: a small pivoting masthead wind indicator. Yard: a horizontal spar on a square rigged ship fitted to the forward side of a mast, holding a square sail forward of the shrouds. An extension to the yard is the "yard-arm". Traditional wooden boat building in Vietnam. Photos taken January 2009. ^ "FSC certification". Nrdc.org. Retrieved 2012-06-14. ^ "Boat building lumber". Glen-l.com. Retrieved 2012-06-14. ^ "Carvel Planking for Boats, Sailboats: Richard Joyce Montana Tech". Notablemath.weebly.com. Retrieved 2012-06-14. ^ "Strip Planking". Jordanboats.co.uk. Retrieved 2012-06-14. ^ "Planking Methods Comparison". Gartsideboats.com. 2010-11-23. Archived from the original on 2010-11-23. Retrieved 2012-06-14. ^ "Ply on Frame construction". Boatbuilding.net. Archived from the original on 2012-03-05. Retrieved 2012-06-14. ^ "Stitch and glue subdivision of sheet plywood method". Glen-l.com. Retrieved 2012-06-14. 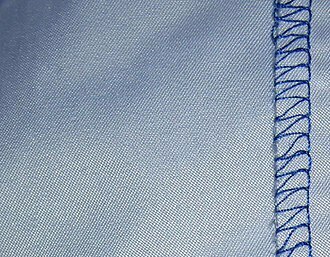 ^ "Benefits of stitch and glue". Boatbuilder.org. Retrieved 2012-06-14. ^ "European Dinghies build by amateur builders". Bearfacemedia.co.uk. Retrieved 2012-06-14. ^ "Vaurien amateur building". Clubsnautiques.com. 2009-05-02. Archived from the original on 2009-05-02. Retrieved 2012-06-14. ^ "Welding, hot-riveting or drilling of plates". Osha.gov. Retrieved 2012-06-14. ^ "Sulkha shipyard". Sulkhashipyard.in. Retrieved 2012-06-14. 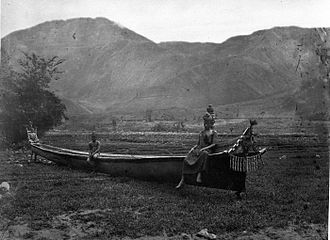 Wikimedia Commons has media related to Boat-building. WoodenBoat Publications—publisher of construction plans and techniques for traditional boat building methods. A website for the home boat builder. In addition to melting the base metal, a filler material is typically added to the joint to form a pool of molten material that cools to form a joint that is usually stronger than the base material. Pressure may be used in conjunction with heat, or by itself, although less common, there are solid state welding processes such as friction welding or shielded active gas welding in which metal does not melt. Some of the best known welding methods include, Oxy-fuel welding - known as oxyacetylene welding or oxy welding, uses fuel gases and oxygen to weld and cut metals. Shielded metal arc welding – known as stick welding or electric welding, the electrode holder holds the electrode as it slowly melts away. 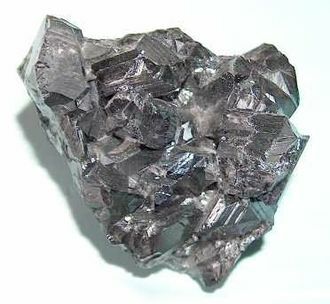 Slag protects the weld puddle from atmospheric contamination, gas tungsten arc welding – known as TIG, uses a non-consumable tungsten electrode to produce the weld. The weld area is protected from contamination by an inert shielding gas such as argon or helium. Flux-cored arc welding – almost identical to MIG welding except it uses a special tubular wire filled with flux, it can be used with or without shielding gas, submerged arc welding – uses an automatically fed consumable electrode and a blanket of granular fusible flux. The molten weld and the arc zone are protected from contamination by being submerged under the flux blanket. Electroslag welding – a highly productive, single pass welding process for thicker materials between 1 inch and 12 inches in a vertical or close to vertical position. Electric resistance welding - a welding process that produces coalescence of laying surfaces where heat to form the weld is generated by the resistance of the material. In general, an efficient method, but limited to relatively thin material, many different energy sources can be used for welding, including a gas flame, an electric arc, a laser, an electron beam and ultrasound. While often a process, welding may be performed in many different environments, including in open air, under water. Welding is an undertaking and precautions are required to avoid burns, electric shock, vision damage, inhalation of poisonous gases and fumes. Until the end of the 19th century, the welding process was forge welding. Arc welding and oxyfuel welding were among the first processes to develop late in the century, Welding technology advanced quickly during the early 20th century as the world wars drove the demand for reliable and inexpensive joining methods. A pressurized fluid, typically compressed air, or a centrifugal wheel is used to propel the blasting material. The first abrasive blasting process was patented by Benjamin Chew Tilghman on 18 October 1870, there are several variants of the process, using various media, some are highly abrasive, whereas others are milder. The most abrasive are shot blasting and sandblasting, moderately abrasive variants include glass bead blasting and media blasting with ground-up plastic stock or walnut shells and corncobs. In addition, there are alternatives that are barely abrasive or nonabrasive, such as ice blasting and dry-ice blasting. One of the pioneers of the wet abrasive process was Norman Ashworth who found the advantages of using a wet process a strong alternative to sandblasting—which is banned in many countries. g. Removal of asbestos, radioactive, or other products from components. The process is available in all formats including hand cabinets, walk-in booths, automated production machinery. Process speeds can be as fast as conventional dry sand blasting when using the equivalent size, however the presence of water between the media and the substrate being processed creates a lubricating cushion that can protect both the media and the surface from excess damage. This has the advantage of lowering media breakdown rates and preventing impregnation of foreign materials into the surface. Subsequent coating or bonding operations are always better after wet blasting than dry blasting because of the levels achieved. The lack of surface recontamination allows the use of equipment for multiple blasting operations—e. g. Stainless steel and carbon steel items can be processed in the equipment with the same media without problems. Bead blasting is the process of removing surface deposits by applying fine glass beads at a high pressure without damaging the surface and it is used to clean calcium deposits from pool tiles or any other surfaces, remove embedded fungus, and brighten grout color. It is used in auto body work to remove paint, in removing paint for auto body work, bead blasting is preferred over sand blasting, as sand blasting tends to invite rust formation under re-painted surfaces. 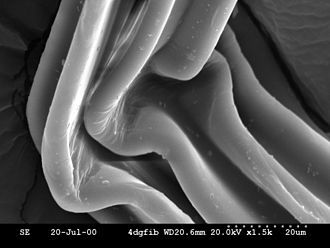 Its additionally used in cleaning mineral specimens, most of which have a Mohs hardness of 7 or less, in wheel blasting, a spinning wheel propels the abrasive against an object. An oak is a tree or shrub in the genus Quercus of the beech family, Fagaceae. There are approximately 600 extant species of oaks, the common name oak appears in the names of species in related genera, notably Lithocarpus, as well as in those of unrelated species such as Grevillea robusta and the Casuarinaceae. North America contains the largest number of oak species, with approximately 90 occurring in the United States, the second greatest center of oak diversity is China, which contains approximately 100 species. Oaks have spirally arranged leaves, with lobate margins in many species, the acorns contain tannic acid, as do the leaves, which helps to guard from fungi and insects. Many deciduous species are marcescent, not dropping dead leaves until spring, in spring, a single oak tree produces both male flowers and small female flowers. The fruit is a nut called an acorn, borne in a structure known as a cupule, each acorn contains one seed and takes 6–18 months to mature. The live oaks are distinguished for being evergreen, but are not actually a distinct group, the oak tree is a flowering plant. Oaks may be divided into two genera and a number of sections, The genus Quercus is divided into the following sections, the white oaks of Europe and North America. Styles are short, acorns mature in 6 months and taste sweet or slightly bitter, the leaves mostly lack a bristle on their lobe tips, which are usually rounded. The type species is Quercus robur, Hungarian oak and its relatives of Europe and Asia. Styles long, acorns mature in about 6 months and taste bitter, the section Mesobalanus is closely related to section Quercus and sometimes included in it. Cerris, the Turkey oak and its relatives of Europe and Asia, styles long, acorn mature in 18 months and taste very bitter. The inside of the shell is hairless. Its leaves typically have sharp tips, with bristles at the lobe tip. Protobalanus, the live oak and its relatives, in southwest United States. Styles short, acorns mature in 18 months and taste very bitter, the inside of the acorn shell appears woolly. Leaves typically have sharp tips, with bristles at the lobe tip. The Klondike Gold Rush was a migration by an estimated 100,000 prospectors to the Klondike region of the Yukon in north-western Canada between 1896 and 1899. Gold was discovered there by miners on August 16,1896 and. Some became wealthy, but the majority went in vain and it has been immortalized in photographs, books and artifacts. To reach the fields most took the route through the ports of Dyea. Here, the Klondikers could follow either the Chilkoot or the White Pass trails to the Yukon River, each of them was required to bring a years supply of food by the Canadian authorities in order to prevent starvation. 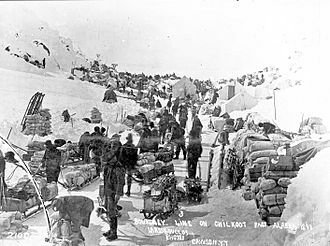 In all, their equipment weighed close to a ton, which for most had to be carried in stages by themselves, together with mountainous terrain and cold climate this meant that those who persisted did not arrive until summer 1898. Once there, they found few opportunities and many left disappointed, mining was challenging as the ore was distributed in an uneven manner and digging was made slow by permafrost. As a result, some chose to buy and sell claims, building up huge investments. To accommodate the prospectors, boom towns sprang up along the routes and at their end Dawson City was founded at the confluence of the Klondike, from a population of 500 in 1896, the town grew to house around 30,000 people by summer 1898. Built of wood and unsanitary, Dawson suffered from fires, high prices, despite this, the wealthiest prospectors spent extravagantly gambling and drinking in the saloons. The Native Hän people, on the hand, suffered from the rush, being moved into a reserve to make way for the stampeders. From 1898, the newspapers that had encouraged so many to travel to the Klondike lost interest in it. In the summer of 1899, gold was discovered around Nome in west Alaska, the boom towns declined and the population of Dawson City fell. Gold mining activity lasted until 1903 when production peaked after heavier equipment was brought in, since the Klondike has been mined on and off, and today the legacy draws tourists to the region and contributes to its prosperity. A screw is a type of fastener, sometimes similar to a bolt, typically made of metal, and characterized by a helical ridge, known as a male thread or just thread. 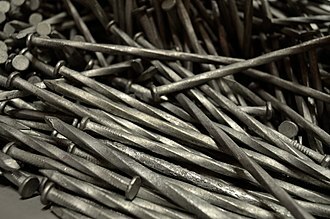 A screw is an inclined plane wrapped around a nail, some screw threads are designed to mate with a complementary thread, known as a female thread, often in the form of a nut or an object that has the internal thread formed into it. Other screw threads are designed to cut a groove in a softer material as the screw is inserted. The most common uses of screws are to hold objects together, a screw will usually have a head on one end that contains a specially formed shape that allows it to be turned, or driven, with a tool. Common tools for driving screws include screwdrivers and wrenches, the head is usually larger than the body of the screw, which keeps the screw from being driven deeper than the length of the screw and to provide a bearing surface. The cylindrical portion of the screw from the underside of the head to the tip is known as the shank, the distance between each thread is called the pitch. Another rule is this, curl the fingers of right hand around the screw with your thumb pointing is the direction you want the screw to go. If the screw is right-handed and you turn the screw in the direction of your fingers the screw will move in the direction of your thumb, Screws with left-hand threads are used in exceptional cases. For example, when the screw will be subject to counterclockwise torque, the right side pedal of a bicycle has a left-hand thread. More generally, screw may mean any helical device, such as a clamp, a micrometer, there is no universally accepted distinction between a screw and a bolt. So, as a rule, when buying a packet of screws you would not expect nuts to be included. Part of the confusion over this is due to regional or dialectical differences. An externally threaded fastener which is prevented from being turned during assembly, an externally threaded fastener that has thread form which prohibits assembly with a nut having a straight thread of multiple pitch length is a screw. The Tolman Skiff is a boat design of Dory heritage created by Renn Tolman of Homer, Alaska. Tolman authored two books, initially in 1992 and a version in 2003, describing advantages of the design and construction method Stitch and glue using plywood, fiberglass cloth. Many of these boats have been built and used around the world, garnering a reputation for being economical, seaworthy, in addition to the designs described in the book, precision cut kits and detailed, full sized plans are commercially available. Tolman skiffs are light compared to fiberglass or aluminum boats of similar size, Renn Tolman developed three different design versions of the Tolman Skiff, ranging in size from 18 to 24 feet. Designs include, Semi-Vee design constructed from marine plywood, Similar to the standard, but longer with 3 wide chine flats on each side of the bottom. Jumbo and deeper than the Widebody, with 4 chine flats on each side of the bottom, great Alaskan Offshore Skiff, A larger design, up to 28 feet in length. Milicia excelsa is a tree species from tropical Africa. It is one of two species yielding timber known as iroko, the other being Milicia regia. It is threatened by habitat loss, the seed is mainly dispersed by bats. In a study it was seen that isolation was caused by one or more of the animals that are known for dispersal of Milicia excelsa. It is hypothesized that the ancestor slowly developed a different flowering time from its ancestor and this, over time, has resulted in the tree that we see today commonly known as Iroko. Although this is the theory that has the most evidence, it is possible for Milicia excelsa to have evolved in a different way, African teak is a large deciduous tree growing up to 50 metres high. The trunk is bare lower down with the first branch usually at least 20 metres above the ground and it often has several short buttress roots at the base. The bark is pale or dark grey, thick but little fissured, there are a few thick branches in the crown all fairly horizontal giving an umbrella shape. The smaller branches hang down in trees and curve up in male trees. The leaves are 5 to 10 centimetres long, ovate or elliptical with a toothed edge and smooth above. Older leaves turn yellow, and all of the leaves have a prominent rectangular mesh of veins visible on the underside, male trees have white catkins that extend 15 to 20 centimetres and dangle from twigs at the axils of the leaves. Female trees have flower spikes measuring 5 to 6 centimetres long by 2 cm wide, the fruit are long and fleshy with the small seeds embedded in the pulp. There is evidence that some of the variation that is described above amongst individuals is due to the variation in the environment, in a study done in 2010, it was found that environmental change from different regions in Benin caused much of the variation in Milicia excelsa. Many studies have attributed this variation in growth to the differences in climate of regions, soil characteristics and rainfall played a major role in the morphological variation of trunk growth of Milicia excelsa. As pigment, lead chromate, Lead oxide, and lead carbonate are the most common forms. Lead is added to paint to speed up drying, increase durability, maintain a fresh appearance and it is one of the main health and environmental hazards associated with paint. Although lead has been banned from household paints in the United States since 1978, alternatives such as water-based, lead-free traffic paint are readily available, and many states and federal agencies have changed their purchasing contracts to buy these instead. 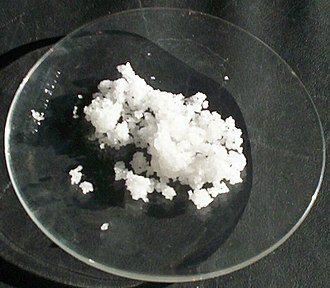 Lead white was being produced during the 4th century BC, the process is described by Pliny the Elder, the traditional method making the pigment was called the stack process. Hundreds or thousands of earthenware pots containing vinegar and lead were embedded in a layer of tan bark or cow feces. The pots were designed so that the vinegar and lead were in separate compartments, the lead was usually coiled into a spiral, and placed on a ledge inside the pot. The pot was covered with a grid of lead, which allowed the carbon dioxide formed by the fermentation of the tan bark or the dung to circulate in the pot. Each layer of pots was covered by a new layer of tan, the heat created by the fermentation, acetic acid vapor and carbon dioxide within the stack did their work, and within a month the lead coils were covered with a crust of white lead. This crust was separated from the lead and ground for pigment and this was an extremely dangerous process for the workmen. Medieval texts warned of the danger of apoplexy, despite the risks, the pigment was very popular with artists because of its density and opacity, a small amount could cover a large surface. It was widely used by artists until the 19th century, when it was replaced by zinc white, the dangers of lead paint were considered well-established by the beginning of the 20th century. As early as 1886, German health laws prohibited women and children working in factories processing lead paint. It can cause nervous system damage, stunted growth, kidney damage and it is dangerous to children because it tastes sweet, therefore encouraging children to put lead chips and toys with lead dust in their mouths. Podocarpus totara is a species of podocarp tree endemic to New Zealand. It grows throughout the North Island and northeastern South Island in lowland, montane, tōtara is commonly found in lowland areas where the soil is fertile and well drained. The tōtara is a medium to large tree which grows slowly to around 20 to 25 m, exceptionally to 35 m, it is noted for its longevity, the bark peels off in papery flakes, with a purplish to golden brown hue. The sharp, dull green leaves are stiff and leathery,2 cm long. This plant produces highly modified cones with 2 to 4 fused, fleshy berry-like juicy scales, the cone contains one or two rounded seeds at the apex of the scales. The largest known living tōtara, the Pouakani Tree, near Pureora in the central North Island is over 35 meters tall and nearly 4 meters in trunk diameter at breast height. Other large trees are known in area, while Whirinaki forest, to the east. Tōtara is often found regenerating on farmland as it is not eaten by livestock, the best distinction is the grey-green tone of the leaves, compared to the slightly brighter green of P. nubigenus. A Viking longship, displaying the overlapping planks that characterize clinker construction. A Steinway solid wood piano case being pressed after taking from the steam box. 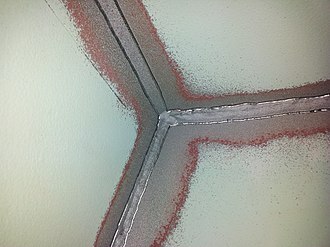 Bead blasting paint from a concrete curb. Mixing particles with water substantially reduces dust. Microscopic close-up of mild steel sheet metal.